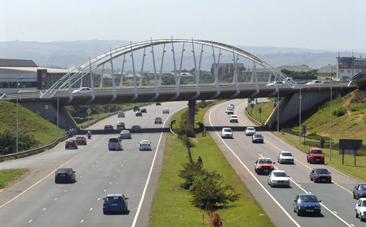 The Government of South Africa is looking to partner with the private sector to address the infrastructure backlog both in South Africa and on the African continent, Public Enterprises Minister Malusi Gigaba told an investors’ conference in Cape Town on Monday. South African infrastructure investments as a percentage of gross domestic product (GDP) had fallen from 16% of GDP in the 1970s to four or five percent of GDP in recent years, Gigaba said. This would be turned around with state company Eskom and Transnet’s built infrastructure programmes, which kicked off in 2004, and the government infrastructure programme announced in 2005. Gigaba said it was important to leverage private-sector funding, pointing out that a number of suppliers to parastatals had large balance sheets and could perhaps help roll out more infrastructure. Companies in the mining, financial and industrial sectors, as well as the state’s development finance institutions, could play a key role in funding infrastructure projects, he said. Gigaba said key sectors of the economy were dependent on the availability of quality infrastructure, which could either constrain growth or increase productivity. South Africa can also begin to play an active role on the continent to partner with fellow African countries to develop their infrastructure, he said. To help boost private investment in South Africa’s transport industry, the Department of Transport and the Treasury will be creating a single economic regulator within the next two years. The move is “recognition by the government that the segment is unattractive to the private sector”. Tranport Director-General George Mahlalela told the conference on Monday that South Africa’s “evolving tariff regime is reactive and does not allow for predictable tariff structures to influence the cost of doing business or guide investment regimes”. Mahlalela said the new regulator would provide certainty by overseeing the pricing of all transport infrastructure, including road, rail, maritime and aviation infrastructure. Previous articleThe Black Church In Crisis? Should Creflo Dollar be Supporting Eddie Long? Regardless Of Who Wins The Election, Nothing Will Change!